Chess will help to improve your chess skills and become a better tournament or casual chess player. If you like this free game, try Grand Master Chess 3. We provide you with free games because of displaying online advertisements. By blocking ads you prevent us from licensing MORE free games for you and many other people around the world and could be a reason of permanent web-site closure. Please consider SUPPORTING us and other visitors by DISABLING your ad blocker on our website. Thank you! Chess is a popular game of strategy between 2 players. You can either have friendly competitions against friends or try solo mode against the computer. Listen to your own music as you play! An incredible level of detail and realistic chess figurines add to the gameplay experience. With a sophisticated hint system that shows several possible moves to help you learn, chess is an enjoyable experience for any chess player. Download full version chess game and play without any limitations! 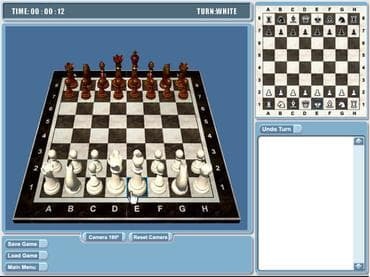 Free Game Features: - Advanced Chess Game Engine; - Amazing Graphics and Relaxing Soundtrack; - Chess Game Statistics; - Free Full Version Game without any Limitations. All free full version games provided at this web-site were licensed, sublicensed for distribution by other game developers, game publishers or developed by internal game studio and provided free legally. If you have questions about Chess game, please contact us using this form.